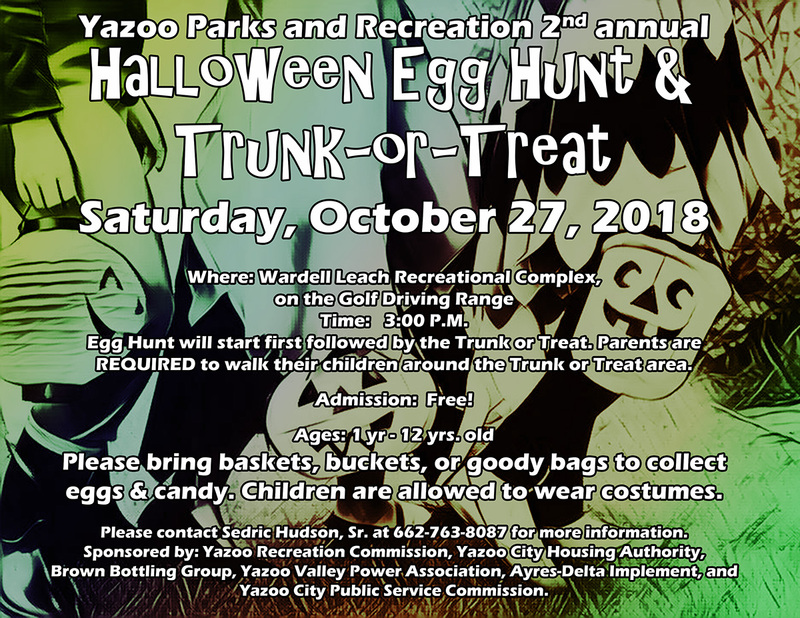 On Saturday, October 27, 2018, at 3 pm, the Yazoo Parks and Recreation Commission presents their 2nd Halloween Egg Hunt & Trunk or Treat! The event will be held at the Wardell Leach Park at 500 W 15th Street, in Yazoo City, Mississippi. Children age 1 – 12 can participate in the Halloween Egg Hunt. Members and organizations of the community which would like to participate by bringing a vehicle, table, or tent to the Trunk or Treat to give away candy are welcome. For more information, please contact Sedric Hudson, Sr., Parks & Recreation Director, at 662-763-8087.